A fast and tactical card game for families and children. 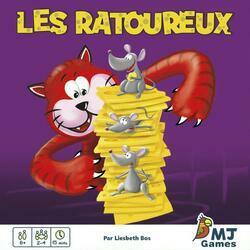 In turn, you play a card with different mice and holes. Mice that are visible through the holes give cheese (points) to the player with this color. If the deck is empty and no one has any cards left in their hand, the game ends. Players get 1 point for the mice visible in their color. The player with the most points wins.